Imported Pre made Henna Cones and Black Henna– Avoid it like the Plague! Only trust henna artists who make their own blend of henna paste. The homemade variety contains natural henna paste and a few other organic ingredients such as rose water all of which have no adverse effects. It is important to know that NOT everyone from Pakistan or India can do Henna. Sometime non experienced and non professional first timers who have no idea about the FDA Safety standards tend to take the easy way out and buy pre-made henna to beat the competition to (unsuspecting) customers. These imported pre-made Henna cones takes months to come to a shelf in a store. They also have chemicals (to get faster coloration) that react differently with sunlight and extreme conditions. When this dangerous product come into contact with human skin, they can have severe after effects. Therefore, it is always best to be safe rather than sorry and hire professional henna artists who use homemade henna in their services. There is no such thing as black henna; period. Anyone who markets it only wants to prey on an unsuspecting customer’s ignorance. Unless you want a permanent souvenir from a trip, stay away from henna artists who use imported pre-made henna cones. Remember, while the scarring does tend to disappear after a week or two, the skin beneath is rarely the same again. 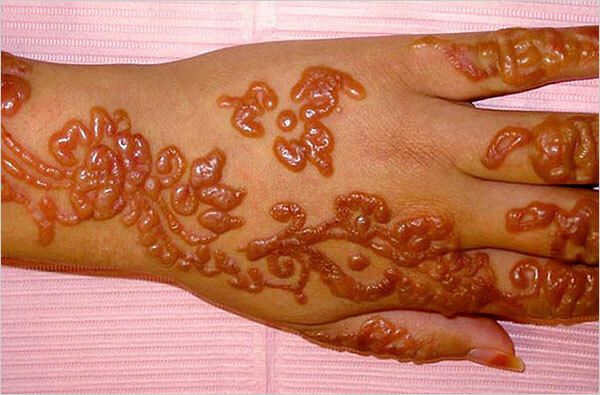 Pre-made imported henna can leave permanent black marks on your skin. So the next time you see someone trying to entice you with a BLACK HENNA tattoo of a phoenix in flight at a kiosk at the beach, keep walking. Temporary tattoos might not involve a scary looking needle that looks like it will peel your skin off, but they do come with their own share of risks; particularly the black variety which is marketed in the form of pre-made henna cones. Sure, black henna might emulate the look of a traditional tattoo better than its brown counterpart. Just be prepared to deal with the repercussions. Black henna is not, nor ever was intended to be used as a henna dye. Why commercialize it as such? It’s because unlike you most people do not bother to do their research about the dangers of this terrible concoction. Allergic reactions ensue. And the allergic reactions aren’t anything to scoff at either. If you don’t want you or your loved ones scarred for life (yes it happens) do not go for a black henna theme at the next Henna party or bridal shower. You won’t even know that you are allergic to it until the PPD decides that it doesn’t like your skin and leaves angry burning blisters in its wrath. Even the name sounds imposing. PPD or paraphenylenediamine is a toxic chemical that is clear until it is combined with oxygen. It is that partial infusion that accounts for the horrendous allergic reactions on people who apply black henna and also happen to be allergic to PPD. The chemical is also used in hair dyes, photocopy ink and dyes in fabric. In fact, according to Dr. Colby Evans, a dermatologist from Austin Texas, a single adverse reaction from black henna is enough to cause a permanent allergy to PPD. Any color additives that are used in cosmetic products must be approved by the FDA (Food and Drug Administration) in order to be considered safe for use. Unless certain color additives come up to the regulatory standards of composition and purity set by the FDA, they cannot be included as ingredients in any product. Black or premade henna does not. In other words color additives in temporary tattoos (such as those that come from pre-made henna) do not comply with the FDA’s restrictions on color additives. This is also why their usage is illegal in interstate commerce. Coupled with the dangers mentioned above, it is easy to see why. Not convinced? Here is what happened to a 19 year old bride in New England who decided to get a black henna tattoo to make her walk down the aisle special. The event was special alright, that is until after the guests left and each of the strokes became itchy bubbling blisters pearly with pus. My Advice – Make your special day more special with a bit of extra precautions and use Natural Henna from a professional Henna Artist rather than getting scarred for life.